This tutorial requires a bit of measuring, so bear with me! 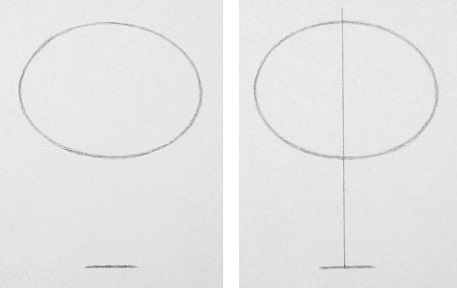 Draw an oval and place a horizontal line below it that is a little bit less than one oval down. Then draw a vertical line down the middle. Draw a line from the marking labelled ‘G’ all the way up through the head. To draw an eye, create a triangle between lines G and H on the Center Line. 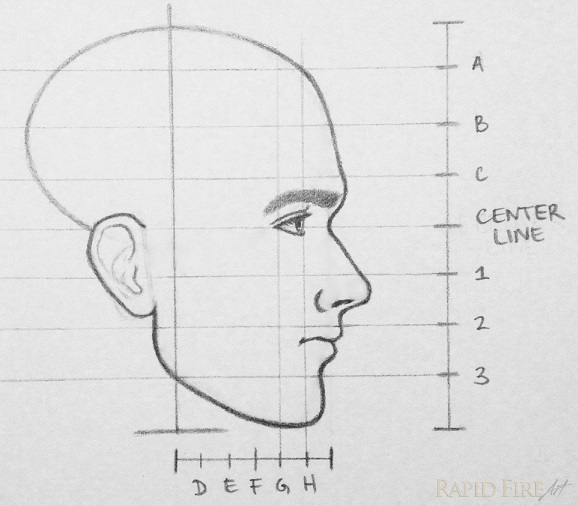 Draw the eyebrow below line C.
If you love RapidFireArt tutorials and want to support what I do, check out my Patreon page! really amazing way to learn. very simple and I agree practice makes perfect. thank you darlene this will really help to improve my knowledge you good in drawing i liked this congratulations!! Hi Darlene,I’m a self taught artist an do really enjoy doing some of your exercises, one of my teachers in school or someone told me once (and this has helped me alot,and maybe it will help some of your followers)they said”draw it the way it’s supposed to look and not the way you want it to look”this has helped me numerous times,thank you soo much and keep up the great work! I wish i could see you so you could help me draw as good as you because my drawing is so messed up and you are a great artist.Keep up the good work!!!!!!!!!!!!!!!!!!!!!!!!! Thanks For sharing. Good Information, Clearly explained. Very Nice tutorial, but I need to learn how to shade so I can paint the faces that I’ve drawn. Thank you , you do an awesome job going step by step. I like this one. Of all the drawings, side view is the only one im good at. I’m curious where you studied. Your drawings are so amazing and detailed. Your bio says that you were self-taught. Did you really never receive any instruction? I learn from doing and then improving upon my mistakes. It’s the long route, but I really enjoy it! This was very helpful! 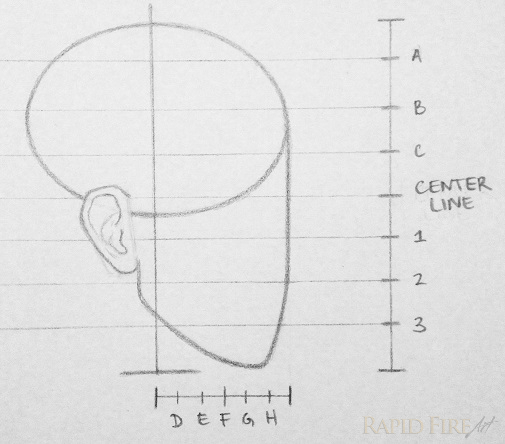 I already know how to draw a face from the front. The profile has been a problem for me. Thanks! Darlene will you be drawing the head in a 3/4 view. I would love to see it and I believe other people would like to as well. Hi Riccardo, I will start that one soon. Thanks for the reminder! 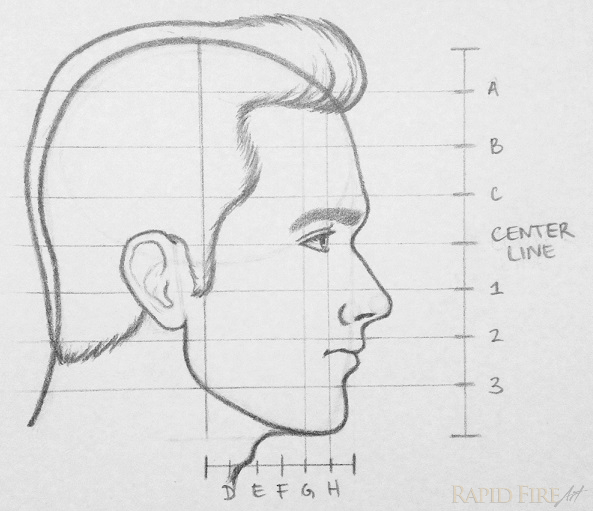 I love the way that you show people how to draw in very specific steps, but is this tutorial only for men! because I’m pretty sure that a woman’s face has slightly different proportions. I’d love to hear an answer soon. How would I make difference between male,female ,child and olds? And how to bring up emotion on face? Will these ability come automatically with practice or there’s any tricks? Hi Mukit, I would have to study more faces to answer you on that. As for emotion, I think it helps to study your face in the mirror. Start with relaxing your muscles and then switching between various emotions and make note of the way your muscles pull each individual section of the face. Does the distance between your lips and nose decrease when you smile? How much do your lips curve down when you frown? How many centimeters does your face lift up when you’re surprised?